For many, Disney World brings back memories of magic, long lines, and expensive food. However, as well as these memories, about 100 L-S music students now have additional memories of being behind-the-scenes in the “most magical place on Earth” that will last a lifetime. This October, the Lampeter-Strasburg High School music directors, Mr. Rob Shaubach, Mr. Erik Welchans, and Mr. Larry Royer, announced plans for a long-awaited trip to Disney World. After months of fundraising and organization by parents and students alike, the 120 students, teachers, and chaperones pulled out of the high school parking lot in three Disney-bound buses on April 11. After a grueling overnight 19-hour bus ride, the group arrived in Hollywood Studios, Orlando, Florida. The day was filled with blaring hard metal music on Rockin’ Roller Coaster and screaming heads off at Tower of Terror. And after a mostly sleepless Tuesday night, Wednesday night was a different ball game with lights out at 11 PM and most fast asleep by then. On Thursday morning and afternoon, the music students had the opportunity to learn in a workshop run by Disney Performing Arts. There, teaching artists taught students what being a professional musician, specifically at Disney World, is like. They got to share in that experience by sight reading and then recording portions of a Disney soundtrack. 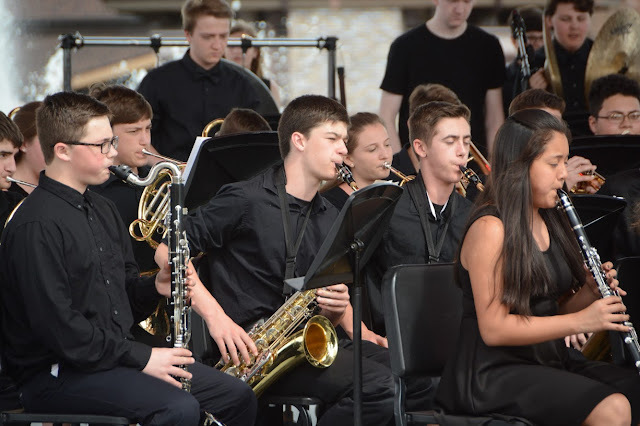 “It’s what every school director wants to do: students prepare on their own, have one rehearsal, and then perform,” band director Mr. Larry Royer shared. Chorus students sang selections from “Frozen,” led by senior soloist Jaclyn Kuro and junior soloist Steve Greenwood. The orchestra recorded selections from “Tangled,” and band played the music of “Tarzan.” After the workshops, students visited Epcot and had the opportunity to watch the famous “IllumiNations” fireworks show followed by a well-deserved night’s rest. On Friday morning, the L-S students and directors got to encounter something that most cannot. All three music groups performed a 25-minute concert in Disney Springs, formerly Downtown Disney. “Part of the draw to Disney was the experience of performing on a world class stage,” Mr. Royer explained. However, the trip was more than just music. Sophomore Delaney McCormick felt that friendships were a huge part of the trip. “It was great to spend time with my friends and get closer to them through the trip,” McCormick shared. Junior Ellie Crumpler shared that sentiment. “I loved getting to relive childhood memories while making new memories with friends.” As for junior Laura Komara, she just liked meeting the Disney Princesses. While the highlights and meaningful experiences of the trips varied, each student, director, and chaperone learned something valuable from the trip and felt the Disney magic for the first time or all over again. After all, isn’t that what Disney is really all about? See all the LSHS Music Disney World pictures.